24+ Seeds. 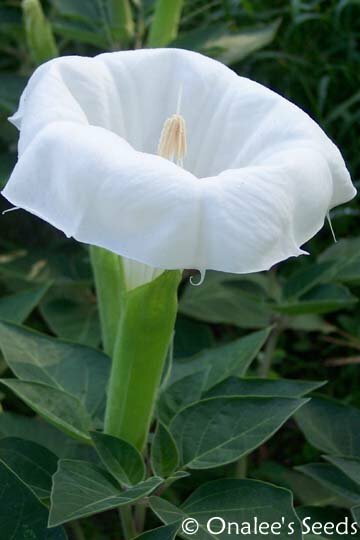 (Larger quantities available) These have fragrant, large (8-10) white trumpet shaped blooms that face upward opening in the evening and staying open until the sun fades them the next day. PERFECT for a NIGHT GARDEN! Plantedin a group, these flowers are very IMPRESSIVE!! 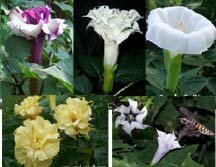 24+ (larger quantities available - check drop down box next to order button) SINGLE, LARGE, WHITE MOONFLOWER DEVIL'S TRUMPET (Datura inoxia) SEEDS PLUS planting instructions, including a color photo for seedling id. 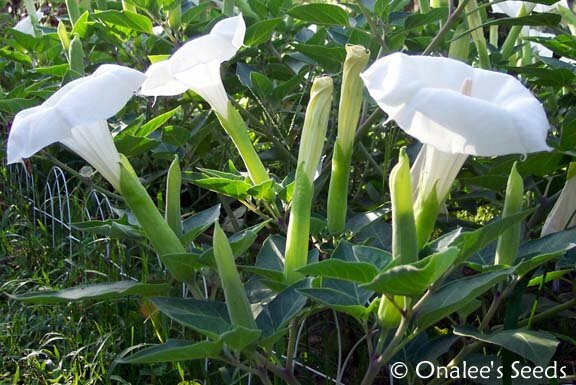 Other common names are: Hindu Datura, Indian Apple, Sacred Datura, Thorn Apple. These plants are sometimes called 'Angel Trumpets', but, in fact, they are not. They are Devil's Trumpets (Genus: Datura), growing as more of a bush with upright facing blooms. Angel Trumpets are Genus 'Brugmansia', grow more as a tree with downward facing blooms. 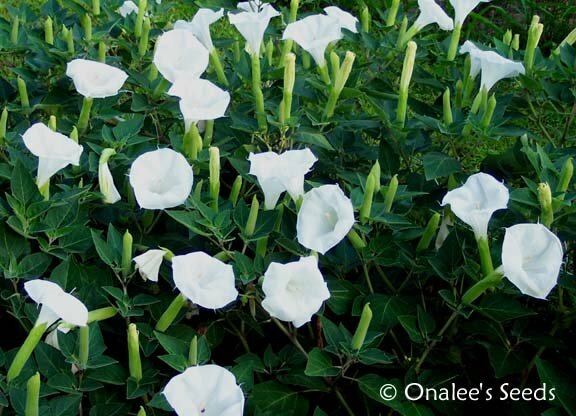 These have VERY fragrant, large (8-10) white trumpet shaped blooms that face upward opening in the evening and staying open until the sun fades them the next day. PERFECT for a NIGHT GARDEN! Planted in a group, these flowers are very IMPRESSIVE with their huge, pure white blooms facing the heavens each night! 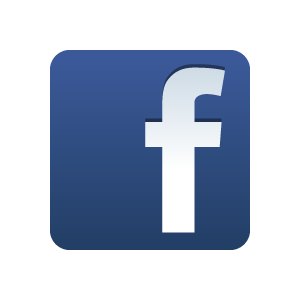 Each plant will grow to a height of 4" and a width of 3" and will have multiple blooms at any given time and bloom continuously throughout the summer. Plant in full sun or mostly sun, but too much shade will limit the blooms you get on this beauty! Datura?s produce several seed pods during the year and thrive in high heat, particularly in humid areas. Very attractive to butterflies, hummingbirds and sphinx moths (hummingbird moths). This is an annual but will self-sow for next year if you let the seed pods fall to the ground.